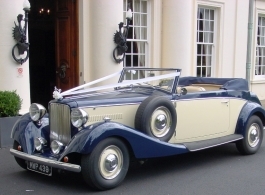 The Jaguar Royale Drophead wedding car is a replica 1930's style convertible. In dark Blue and Cream with sumptuous Cream leather interior and walnut trim, it offers elegance and style of bygone days with the luxury and convenience of modern motoring. The doors on the rare Jaguar Royale Drophead are very large enabling easy access for a bride wearing the fullest of wedding dresses and there is ample rear leg room to stretch out and be comfortable on route.